The setup is horizontal from the beginning. You asked what is the top and the bottom of the cycloid. I used the vertical wheel to explain the top and the bottom, I never changed the experimental setup. I stick to 1m radius wheel. Having said that when the train moves at constant velocity in the straight line then balls follow cycloid trajectories that have changing radius in the ground frame. No. The radius is the distance between the ball and the hub, period. Read Dave's post, he explains it excellently. If you don't understand reread it till you do. Last edited by MRC_Hans; 22nd August 2018 at 11:33 AM. 20 August 2018 SDG: Ignorance of an Feynman describing the Einstein equivalence principle in reply to a question about this thread. 20 August 2018 SDG: Where is the experiment in a freely falling laboratory in this thread? 21 August 2018 SDG: A fantasy that any of the questions in post 192 (ignorance about centripetal force) relate to GR. 21 August 2018 SDG: Cannot understand a Feynman quote ending "That is the basis of the principle of equivalence" is about the principle of equivalence! 22 August 2018 SDG: Clear ignorance about the 'simple pendulum' (m is a point mass). The bold part of the statement in the quote needs a correction. The force is perpendicular to the trajectory at one point only when we are talking about the ideal cycloid when translational velocity equals the tangential velocity of the rotation. If we consider the curtate and prolate cycloids then there are TWO points where the forces are perpendicular to the cycloid trajectory. The top and the bottom of the cycloid. That's one of the reasons I have chosen B and T points, there is no tangential component of the acceleration only normal. If we consider the train moving at 1m/s and the wheel rotation 0.5rad/s then the radius of the curved cycloid trajectory at the top is 9m and at the bottom 1m. F_l CANNOT be the same for all radii when you apply a d(omega)/dt to the wheel. with all due respect to your knowledge you are wrong here. I am talking about the top and the bottom of the cycloid radii, not a real physical wheel. The real physical wheel has 1m radius at the top and the bottom of the cycloid. I'll just leave it with you because it appears to me you would not listen to me anyway. Maybe some other fellow posters can explain to you your mistake. Now, you recommended to me to learn some basic physics, thank you. I did and I have a present for you from the 'advanced' physics. I can change d\omega\dt by applying force (units N) that is 90 degrees to the rotation trajectory, that means it is not causing any torque. The \omega change is caused indirectly as second order effect. It's a kind of magic, you know? I hope you get the humor. All is good my friend. Last edited by SDG; 22nd August 2018 at 08:13 PM. ... because you are one sided and you are not recording errors and ignorance of the other posters. FYI - I don't mind, really, be my guest. The other people will see you for what you are. ... and by the way, based on a few comments you made in this thread you are in no position to judge. Last edited by SDG; 22nd August 2018 at 08:19 PM. 23 August 2018 SDG: A trolling insult, a "no position to judge" insult, and a "one-sided" lie. I am recording your blatant errors and obvious ignorance because you are writing blatant errors and obvious ignorance. The other posters have not made any blatant errors or stated any obvious ignorance. FYI: I am in a good position to judge because I have a graduate degree in physics (not used though). I also, unlike seemingly you, know about Wikipedia and Google ! That is why I could state straight off that your simple pendulum assertion was wrong and back it up with Wikipedia. Last edited by Reality Check; 22nd August 2018 at 09:45 PM. Not gonna' happen since you believe that the concept of gravity is included in Electromagnetism, nicht wahr? Maybe skip to the part where you declare victory. The Qsmug* is strong with this one. A simple pendulum has a point mass so no matter how big the bob in a cartoon is drawn, there is no change in centripetal force. A pandemic with a spherical mass is your job to resolve because this is your thread and claim. IOW: Who Do You Mean We Kemo Sabe. A few more times and this will become an ignorant demand we solve a problem that you are showing that you are incapable of solving. Also you will not make it with a 90 degrees angle to the "rotation trajectory", because that would be a force pushing the ball into the rod with which it is connected to the centre of the wheel. you get a d\omega\dt with a TORQUE, which is the cross product of a force and the radial distance of the application location and the centre of the wheel. Seems your "advanced physics" is not all that good. You think by artificially changing the "centripital force" is giving you a "magical" acceleration, I very much doubt that. Then why do you not calculate it? Is it because you can't, or because you won't? Now I would like to discuss the rotation, angular velocity \omega, acceleration and force on a circle trajectory at different radii. The lines across the ball represent radius, equipotential line. The balls undergo the same acceleration. Are the F_cp forces equal in all instances or F_cp_1m > F_cp_100m > F_cp_infinity? This has to be settled before we continue. First of all, we ignore the mentioned acceleration, since it is irrelevant for the question. Instead I have assumed 1 m/s. Next, we must have a mass for the steel balls. I have arbitrarily chosen 1kg. So, seems the obstacle has been removed. Care to continue? The "issue" raised in post #253 is physically meaningless. The centripetal force on an object of mass m describing a curved path of radius R at velocity v is mv^2/R. It cannot be calculated without knowledge of the value of v, which is what you are attempting to do. I was thinking about reeling in the string of the ball straight from the center. The initial force is 90 degrees. If we go with small deltas and a time gap between applying the force then it will be 90 degrees. There is a delay till inertia 'kicks in'. Till all the ball atoms 'realign' and the ball speeds up. When the ball settles then we continue - 90 degrees. The d\omega/dt is caused by the conservation of energy in combination with radius shortening. you missed very important details, the radius and omega determine tangential velocity. Let's go with 1kg. The acceleration is the same 1m/s^2 and F=ma gives the same result as the calculator. Now we are back at the 'cutouts' issue. The radius and omega give us v.
Only for motion in a circle in a frame of reference where the centre of the circle is stationary. For motion along a cycloid, as I pointed out, v is continuously varying and cannot simply be determined from the local radius of the cycloid and the rate of rotation of the wheel; in fact, v at any point is the vector sum of the velocity due to rotation of the wheel and the movement of the train. Its direction aligns to that of the cycloid, obviously, and its magnitude is the v term in mv^2/R. And, as I've pointed out many more times now than I can count, that's the source of your error. OK, right. So you could calculate it yourself. Then why all the fuzz? I don't understand the meaning of the highlighted part. The balls on your wheel move in an 1m radius circle, regardless of the speed of the train. So, changing the setup of your experiment again? Is there anything you won't do, to try and cover up your mistakes? No, in this completely new scenario the acceleration of the angular frequency is caused by conservation of angular momentum, not conservation of energy. the acceleration at the center of the balls where the center is determined at the rest (no rotation). Let's call the acceleration only a_cp because they are all equal. Where is an error in this? The acceleration mentioned is not only irrelevant, it is also a fault, because the rotation rate is also stated (in rad/s, for whatever reason). You cannot both state an acceleration and a velocity. ALthough the three errors are identical, I still count three, since it is carefully repeated with different rotation rates. Irrelevant acceleration not only repeated, but the statement is wrong: Since the rotation rates and traveled distances are not the same, it cannot be the same acceleration. As SGD finally calculated, the two first ones are actually identical. The sentence makes no sense. Mass is mass. There is no such thing as "inertial mass", but mass has inertia. This affects the response of mass to forces, but that is not what the statement says. Finally, of course, and I don't count this as an error, although it must be a disappointment to SGD, the realization that the centripetal forces in the examples are actually equal somewhat defuses the argument SGD is trying to make. But have heart, SGD: First of all, your argument was wrong anyway, and also I believe this is just a coincidence that you should exactly these ratios. Thanks Hans! As a layman (and definitely not a physicist) I appreciate you (and Dave too and the other posters!) taking the time to deconstruct SDG's arguments. Sadly, I feel that this thread is headed into FE territory or perhaps EU territory (admittedly, I'm not up on my EU theory*). *Lousy Brexiters -I kid, I kid. What? There is no delay till inertia kicks in. Yes, if you reel in the string, the conservation of angular momentum will cause the ball to accelerate. There was never any setup regarding this. I just stated that d\omega/dt can be done with changing radius. You came with your version 'pushing' and I said that I had in mind 'pulling'. That's all. This scenario, changing radius, can be solved by both approaches. Conservation of energy and conservation of angular momentum. Let's assume a rigid body, a ball of mass m=1kg, radius r_1m=1m and \omega_1m=1rad/s on a string and we will change the radius to r_0.5m = 0.5m. Now how do you propose to solve for v_0.5m and \omega_0.5m with conservation of angular momentum? Remember this is a rigid body. If you do this by pulling in the string, then you are doing work on the ball, which you have to account for in the conservation of energy equation. Your conservation of energy equation, as stated, is therefore incorrect. And this has absolutely NOTHING to do with the original setup, whether with the wheel horizontal or vertical. And the fact that it is a rigid body makes it even easier when using conservation of angular momentum, but who cares? Quit discussing unrelated stuff and focus on the REAL mistakes in your experiment. Last edited by tusenfem; 24th August 2018 at 07:28 AM. You are right. The Coriolis force from dr will add omega delta that needs to be added to the right side of the equation. That would account for the work done on the ball. So we can assume that the point you were trying to make in post #302 is actually invalid, because you'd left a crucial term out of your conservation of energy equation, right? #1-#3 are not errors they are stating obvious. What? Just see the lines above. If there is an accelerometer in the center of the ball it will measure 1m/s^2 in all instances. If we calculate the force/tension on the string as a sum of all atoms. Are we going to get the same value for 1m and 100m radii? I think you're gradually groping your way towards the startling revelation that the moment of inertia of an object is dependent on the shape of that object. Forgive me for being the one to break it to you, but you may not be the first person in all of history to have made that deduction. No, the point is that the conservation of energy can be used to calculate the new velocity when dr is changed. It is a valid point. And a trivial one. Demonstrating something already known and irrelevant to your claim, I'm sorry to say, is not a valid proof of your claim. The latter, we're all getting rather tired of waiting for. However, it's also a valid point that if you ignore important terms in a calculation, you'll get the wrong result. So far, that's the only thing you've demonstrated to anyone else's satisfaction. Let's get back to your topic, shall we? Post #253 has been answered; please proceed with your argumentation. Your answer #299 has many problems, see #307. Where are your comments on #253? I told you before, I'm not interested in playing your idiotic games. If you have something to say, say it, then we can tell you what's wrong with it, you can ignore us, you can pretend you're an unappreciated genius and we can all laugh at you behind your back. My only comment specifically on #253 is that you don't get to repeal Newton's Laws just because you can't be bothered to analyse dynamics rigorously. Are the forces equal or they are different? SDG, you are making claims here, not I. I tried to be friendly, but I owe you no answers. If you want to know, calculate it, and show your calculations. If you don't want to do that, fine. Frankly, I don't give a damn. ETA: What makes you even think that you can demand tasks from other posters here? Last edited by MRC_Hans; 24th August 2018 at 10:33 AM. What you're overlooking is that the atoms of the ball don't only differ in their distance from the center of rotation. They also differ in their angular position relative to the "primary radius" between the ball's center and the center of rotation. All the atoms are accelerating toward the center of rotation at ω2r, but for most of those atoms the direction of that acceleration is not aligned with the primary radius. The net centripetal force is the vector sum of that of its individual atoms, not the scalar sum as you're pretending. 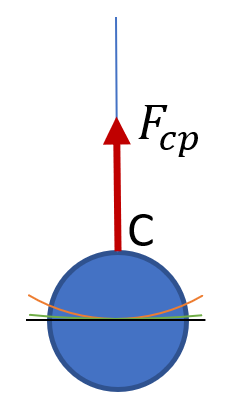 Only the component of the acceleration vector parallel to the primary radius corresponds to centripetal force as measured at the ball's center post. The perpendicular component causes internal stress in the ball (which is balanced by opposite stresses on the opposite side so it produces no motion if the ball is assumed to be rigid). Take a look at your diagram again, and consider which atoms are the farthest off-axis. (Remember to consider the entire sphere, not just the equatorial cross-section disk you've drawn.) And of course, the larger the ball relative to the wheel's radius, the larger the relevant angles and the more pronounced the off-axis effect will be. F=mv^2/R is only valid for a point mass. You're treating the ball as an extended mass for the purposes of calculating the force on it, but as a point mass for the purposes of describing its acceleration. As long as you use different approximations on different sides of the equation, you'll get the wrong answers. If you actually look at your diagram you'll note that more of the ball is outside the circle than inside, and the average accelerations are also different. The fact that more of the ball is outside the circle than inside it is the point he's trying to press. He claims that must cause the centripetal force to differ from the centripetal acceleration, contrary to f=ma. If that were correct, though, it would apply just as well to the simplest cases, e.g. of a spherical (or even horizontal disk-shaped) mass fixed to the rim of a horizontal wheel in a reference frame stationary with respect to the axis of the wheel. Increasing the size of the ball or disk (without changing its mass), or decreasing the radius of the wheel while increasing the angular velocity of the wheel by the square root of the same factor, would supposedly increase the effective centripetal force, because those changes put relatively "more of the ball outside the circle." I think my previous post explains the basic reason why that argument doesn't hold up, as best as can be explained short of working through the messy integrals. Here's an even simpler way to address that question. Consider the "atom" on the left circumference of your drawing, about halfway between where the orange curve intersects the circumference, and where the green curve intersects the circumference. Now consider the atom exactly laterally opposite that one, toward the right, on the right circumference of the ball, about halfway between the orange and green curves. Where is the center of mass of those two atoms? Is that center of mass inside or outside the green curve? Inside or outside the orange curve?